Oh my goodness does this post ever make me drool. My organizing friend, Aby Garvey, is here talking about containerizing with some functional and fabulous ideas. Be prepared to be inspired! 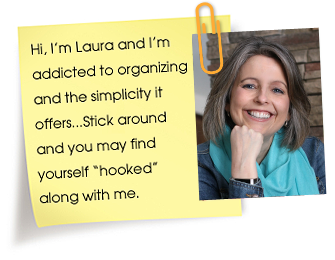 Those of you participating in the 28 Day Organizing Challenge will be in the running to win a seat in Aby’s upcoming workshop, Organize Your Paper Clutter, which begins March 9th. At this point in the challenge, you’re probably putting the finishing touches on your organizing project. Or in other words, it’s time to have some fun! It’s time to select containers and put the icing on your organizing cake. Here are some ideas for choosing containers, and making the most of this really fun part of the organizing process. While this one can be a bit counter intuitive, it really does work better to select your containers after going through your items. Decide what to keep and what to let go of, grouping your keepers together in categories that make sense to you. Then, find a suitable storage container for your collections. By knowing what categories I wanted to use for my rubber stamps, I knew how many glass jars to purchase, as well as what size jars would work best. 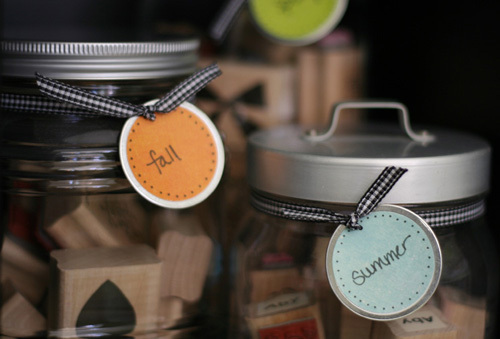 If I had purchased jars before organizing, chances are good I would have run back to the store a time or two, or I would have grouped my stamps together in ways that fit my glass jar collection, instead of in ways that fit my creative process. When you organize first and store second you keep your options open. This means you increase the likelihood that your space will work great for you…today and going forward. 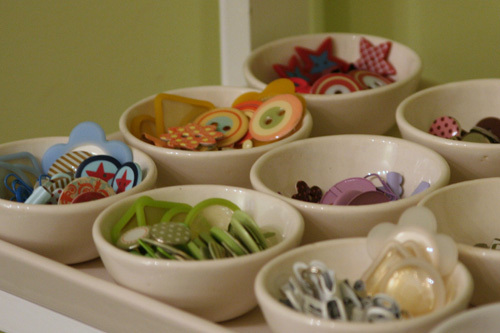 I firmly believe the more you love an organizing solution, the more likely you are to use it! So, choose containers that really make you happy—those you’ll enjoy using day in and day out. Not only will you love how your space looks, you’ll also be more motivated to keep it organized going forward. …to keeping my collection of catalogs under control. Maybe buckets aren’t your thing (which is totally fine, of course). Simply figure out what your thing is when it comes to containers, and work that thing into your organizing project. When you do, you’ll really love your finished space. When organizing your house, shop at home for containers before heading out to the store. 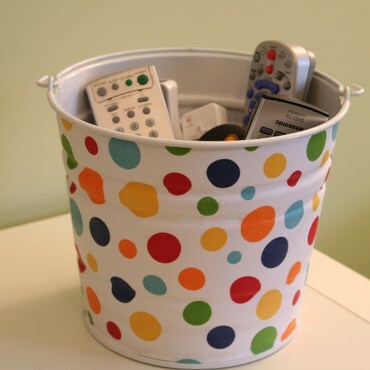 Look around for items you can repurpose or use in a new way. 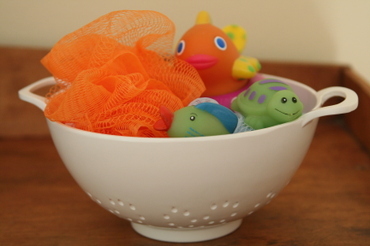 How about using a plastic colander for tub toys? 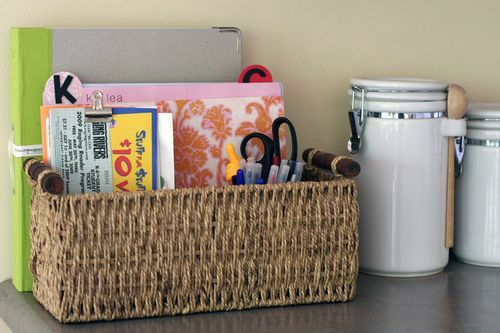 Or a wicker basket for corralling files and other office essentials on the kitchen counter? Perhaps you’d like to use votive candle holders to store and display small craft items? 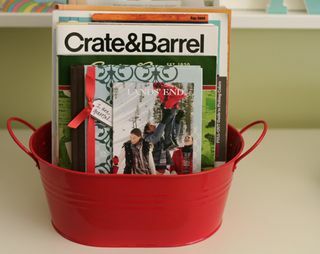 Take a look around your home…what container can you repurpose to add a creative touch to your organizing projects? Whether you’re organizing your craft space or the files in your home office, look for ways to use containers to add a delicious, finishing touch. Aby Garvey is an organizing expert who believes organizing can be creative and fun—the more you love an organizing solution the more likely you are to use it! She is the co-owner of www.simplify101.com, a professional organizing business that specializes in online organizing workshops. Visit www.simplify101.com to sign up for Aby’s monthly organizing newsletter and weekly organizing quick tip. Great tips. I used a lot of my old containers for the challenge and didn’t have to buy anything new. I found these awesome baskets at the Dollarrama last week. I limited myself to only 2 because I knew I wanted one for my remotes and one for other things on my coffee table. Since I’ve brought them home I’m thinking I might go back and get a couple more to have one for each bedside table. I wish they had come in larger sizes because it’s exactly what I’m looking for (but wayyyy to small) to put on the shelf under my console table. Hopefully I’ll soon get a post ready for the 28 day challenge. I’m loving my livingroom right now. and I can see how easy it is to fall out of an organized routine. I had to spread a few papers around tonight and almost instantly I panicked because it looked messy! Not going down that route again, no way no how! Fantastic tips! I am a container freak and have been known to walk around the house with a newly acquired container trying to find something to put in it! I now will have a new eye for different types of containers and how to repurpose them around my home. I like the craft items! Okay the basket in the kitchen is just what I need for my mail and papers!!! Love the post! Thanks for sharing!